Raised G arden Beds - all beds have 12 inches of planting depth. Top 10 Reason Raised Beds Are Better. Raised beds warm more quickly in the spring. Raised beds extend the growing season. Raised b eds drain better. Soil doesnt get compacted from traffic. Customize your soil to maximize growth potential. 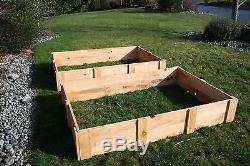 Raised beds require less work to start and to maintain. Raised beds produce higher crop yields. Less water and fertilizer waste. Simplified weed and pest control. Reduce d space requirements for gardening. 100% All natural untreated cedar. Naturally bug and rot resistant. Extra deep 12 planting depth. Rough mill cut cedar deters slugs. Galvanized Hardware for long life. Quick assembly, 4 screw per corner. 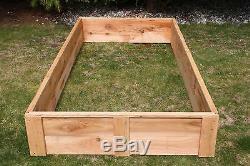 Raised beds are the best choice for a home garden and requiring least amount of work to start. 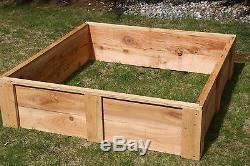 With these beds, you can have a garden ready and planted in less than a weekend. You can plant earlier in the growing season and grow longer into the fall. We offer multiple sizes to fit any garden size, mix and match sizes to create your garden design. We design our beds for easy assembly and recouping your investment typically within the first growing season. Grow healthy fresh organic food for your family, supplement your family budget and live a sustainable, self reliant low footprint live style If you are unsure what size is best for your, check out our Green Thumb 101. Why Cedar Is The Best Choice. Cedar for your garden is by far the best choice. Naturally rot and decay resistant, and will outlasting anything made from spruce, pine or fir. This ensure the highest quality possible product that will last for years, while supporting another small family business. We are often asked how long our elevated beds will last? Our garden beds, made from the same materials, are going on 10 years without a single issue. Another advantage of cedar over beds made from synthetic/plastic decking boards, if cedar will not become brittle, chip or crack over time. However the biggest reason is the fact that our cedar materials are all natural, untreated and perfect for growing organic vegetables. There is nothing worse for an organic garden than using treated lumber or worse yet, railroad ties. If you plan is to grow healthy organic produce for your family, you need to start with organic materials. 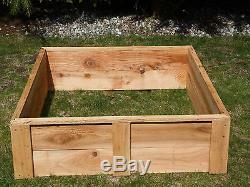 2 Foot Wide Raised Bed Garden Boxes. Perfect size for a garden against a wall or fence. The short distance allows anyone to reach across the entire bed with ease, making these a great choice when placing your garden against a wall, fence or other structure. Beds are 24 wide and various lengths. 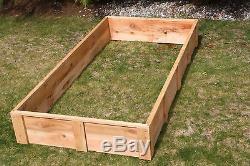 3 Foot Wide Raised Bed Garden Boxes. A happy medium between our narrow two foot wide beds and our widest four foot beds. Use as a stand alone garden or against a wall or fence, just be sure you can reach across to the back side of the bed. Arrange multiple boxes into design for a custom garden display. Beds are 36 wide and various lengths. FREE s hipping via Fed Ex. (3 foot end panels do not have center vertical support as seen in photo to left, it will similar to our 2 foot panel above). 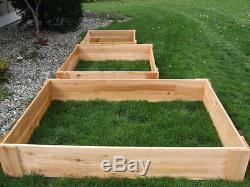 4 Foot Wide Raised Bed Garden Boxes. These four foot wide beds are the exact beds we use in our home gardens to grow all the produce our family of 4 can eat. Beds are 48 wide and various lengths. FREE s hipping via FedE x. ASSEMBLY INSTRUCTIONS: Tools required - Corded or Cordless drill with Phillips bit. The end panels are pre-drilled for the 4 screws required (included) for each corner. Full assembly video coming soon. 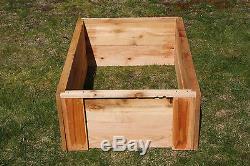 The item "Cedar Raised Bed Garden Boxes made in the USA grow your own organic vegetables" is in sale since Wednesday, January 22, 2014. This item is in the category "Home & Garden\Yard, Garden & Outdoor Living\Gardening Supplies\Plant Care, Soil & Accessories\Baskets, Pots & Window Boxes". 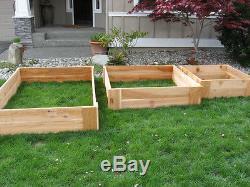 The seller is "usa_gardencompany" and is located in Poulsbo, Washington. This item can be shipped to United States, Canada, Australia, South Korea, Indonesia, Taiwan, South africa, Thailand, Hong Kong, Mexico, Philippines, Singapore, Malaysia, Brazil, Chile, Colombia, Costa rica, Dominican republic, Panama, Trinidad and tobago, Guatemala, El salvador, Honduras, Jamaica, Japan, United Kingdom, Denmark, Romania, Slovakia, Bulgaria, Czech republic, Finland, Hungary, Latvia, Lithuania, Malta, Estonia, Greece, Portugal, Cyprus, Slovenia, China, Sweden, Belgium, France, Ireland, Netherlands, Poland, Spain, Italy, Germany, Austria, Israel, New Zealand, Switzerland, Norway, Saudi arabia, Ukraine, United arab emirates, Qatar, Kuwait, Bahrain, Croatia.